There is a very specific intimacy that accompanies working with dough in the morning that differs from other times of day. Both you and the dough are waking up at the same time, the chemistry between you fresh and vulnerable, feeling different in the early light. There is a raw sensuality to the interaction, unclouded by haste or desire, but rather an honest, honoring approach to starting off your day well-fed and satisfied. Inspired by a recent Pinterest browse and the contents of my fridge, which held odds and ends of produce from this past week’s meals, I used the dough as a meeting place for these unattached vegetables and made a delicious breakfast pizza. Usually, when I've got just a little bit of this and that, I am grateful for eggs, and will often whip up a frittata or an omelette with any remaining produce, but this morning I felt particularly indulgent and wanted to use eggs in a different way. My fridge boasted a few cherry tomatoes, some stalks of asparagus, two green onions, a handful of portobello and shiitake mushrooms, a heel of Parmesan, a bit of aged cheddar, a couple rashers of smoky bacon, and a shallot or two: ingredients just begging to come together in pizza form, with the addition of fresh organic eggs cracked on top of the pizza before it is baked. This pizza makes an ideal breakfast: fresh vegetable flavors that meld together atop a crispy-then-soft crust, the egg yolks breaking open sexily across the textured terrain of toppings. Perfect for mornings - or mornings after. 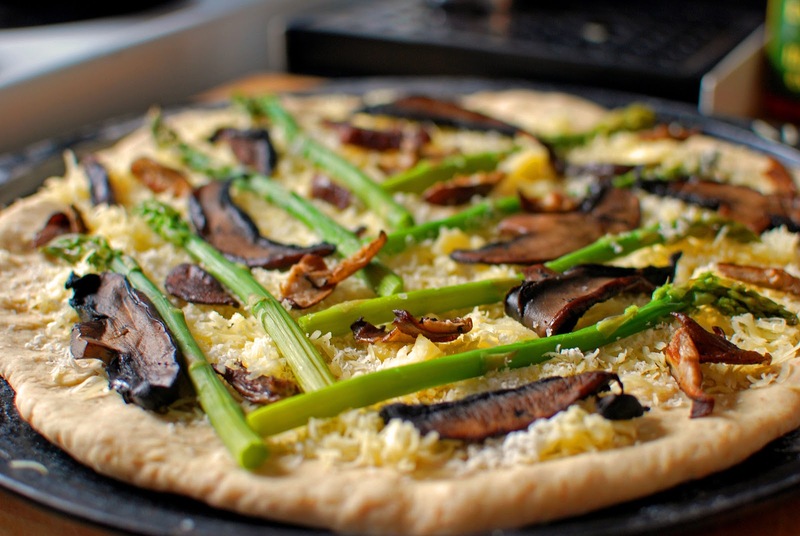 For the pizza toppings: cheese is grated, cherry tomatoes are halved, and asparagus gets the steam treatment while mushrooms are bathed in a bit of butter. While the toppings are prepared, the oven is preheated to 425 F. It is important to get your oven hot for your pizza - this is what achieves the desired crisp-then-soft texture of the crust. Make sure you preheat yours before preparing the dough for your crust. With the toppings ready to go, the crust quickly comes together. What I love about this particular pizza crust recipe is the lack of rising time required for the dough, allowing for more time spent with whomever you're sharing your breakfast table with. Some of the flour, the yeast, oil, and a cup of warm water are briskly brought together in the bowl of a stand mixer fitted with the paddle attachment and beaten on high speed for 3 minutes. The remaining flour is added, the paddle attachment is switched for the dough hook attachment, and the dough is kneaded for 8 minutes until it is smooth and elastic. The dough is then split into two equal parts, covered, and left to rest for 10 minutes. After their quick nap, the smooth rounds of dough are ready to be pressed down and then gently pulled, twirled, and shaped into pizza crusts. At this point, the cheese is generously distributed atop the dough and the toppings are carefully laid out (or haphazardly sprinkled - it's up to you) on top of the cheese. What elevates this pizza to breakfast status is, of course, the eggs. Three eggs are carefully cracked on top of the pizza, the whites co-mingling with the cheese and toppings. The pizza is then baked in the hot 425 F oven for 12-15 minutes (or until the eggs are mostly set - you want your yolks a little runny and seductive). It is highly satisfying to slice through the yolks and let them languidly pool in the nooks and hollows created by the vegetables. Enjoy! This pizza tastes even better when eaten in a robe, or in someone else's button-up. Combine white flour, yeast, oil, salt, and warm water in a bowl. Beat with an electric mixer, or your stand mixer's paddle attachment on low speed for 30 seconds. Scrape down sides of bowl, and beat mixture on high speed for 3 minutes. Switch to dough hook attachment (or use a spoon) and mix in remaining flour. Once mixed in, knead dough (in machine or by hand) for 8 minutes, or until it is smooth and elastic. Separate the dough into two equal parts, and let rest, covered, for 10 minutes. Once rested, carefully shape the dough by pressing down into a circle, then pick it up by loosely grabbing one end and rotating while gently pulling away from the center, letting gravity expand the dough. You can also roll it out to your desired thickness and shape. Once the dough is about 13" in diameter and 1/4" thick, place on a greased and floured pizza pan or cookie sheet. Sprinkle with choice of cheese and arrange toppings on top. Carefully crack eggs on top of pizza, and bake for 12-15 minutes. Sprinkle with chopped green onion and thinly sliced shallots. Pizza in breakfast? Not a bad idea. Sounds really cool. It looks really delicious in pictures. Thanks for sharing this wonderful recipe with us.